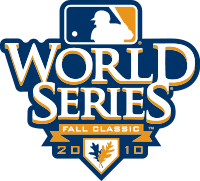 The 2010 World Series was the 106th edition of Major League Baseball's championship series. The best-of-seven playoff, played between the American League champions Texas Rangers and the National League champions San Francisco Giants, began on Wednesday, October 27, and ended on Monday, November 1. 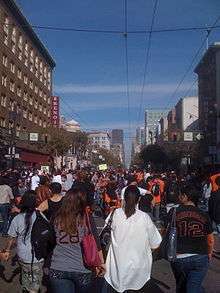 The Giants won the series 4–1 to secure their first World Series championship since 1954 and their first since relocating to San Francisco from New York City in 1958. Édgar Rentería won the World Series Most Valuable Player Award (MVP). Like the Rangers, the Giants and their fans have had a long history of futility and disappointment since their move from New York City to San Francisco before the 1958 season. The Giants had won their last World Series against the Cleveland Indians in 1954. After moving to San Francisco, enraged Giants fans in New York allegedly placed a hex on the franchise, starting the Curse of Coogan's Bluff that would last for over 50 years. Within that period, they made it to the World Series three times, but lost each time. These included a seven-game loss to the New York Yankees in 1962, a four-game sweep by their cross-bay rival Oakland Athletics in 1989 that was marred by the Loma Prieta earthquake, and another seven-game loss to the Anaheim Angels in 2002 after being eight outs away from the title in Game 6 with a 5-0 lead. Their last postseason appearance was in 2003, when they lost to the eventual World Series champion Florida Marlins in the NLDS. The anticipated pitchers' duel between former Cy Young Award winners Cliff Lee and Tim Lincecum never materialized, as Lincecum gave up two early runs and Lee gave up seven runs—six of which were earned—in 4 2⁄3 innings. In the first inning, Lincecum gave up a hit and a walk, respectively, to the first two batters he faced: Elvis Andrus and Michael Young. Andrus scored on a Vladimir Guerrero single that struck Lincecum's leg and bounced into right field. In the second, Bengie Molina singled, advanced to third on a Lee double, and scored on Andrus' sacrifice fly. In the bottom of the third inning, Édgar Rentería reached on error and advanced to second when Lee hit Andrés Torres. Rentería scored on a Freddy Sanchez RBI double, and Torres scored on a Buster Posey RBI single, tying the game. Game 2 started out as a pitching duel between San Francisco's Matt Cain and Texas' C. J. Wilson. Ian Kinsler led off the top of the fifth with a deep fly ball that was perhaps an inch short of a home run. The ball bounced high off the top of the center field wall and back into the field of play, forcing Kinsler to settle for a double. In the bottom of the 5th inning, Édgar Rentería hit a home run into left field to give San Francisco a 1–0 lead. Texas threatened in the top of the sixth with back-to-back singles by Michael Young and Josh Hamilton, who both advanced into scoring position on Cain's wild pitch to Nelson Cruz. Cain subsequently got Cruz and Kinsler to pop out, ending the threat. The Giants added a run in the bottom of the seventh when Cody Ross walked, advanced to second base on a groundout by Aubrey Huff, and then scored on a single by Juan Uribe. Wilson was removed from the game with a blister in the seventh inning and was relieved by Darren Oliver. Cain went 7 2⁄3 innings, allowing only four hits. Cain's outing was his third and final of the postseason, a playoff run in which he pitched 21 1⁄3 innings without allowing an earned run. 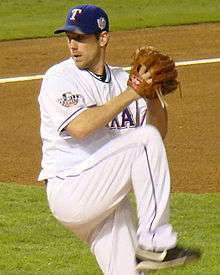 Game 5 was a pitching rematch of Game 1 between former Cy Young Award winners Cliff Lee and Tim Lincecum. Down 3–1 in the series, the Rangers needed a win in their ballpark to send the Series back to San Francisco or the Giants would return home as champions. What resulted was the pitching duel anticipated in Game 1. Both Lee and Lincecum pitched six shutout innings, with Lincecum having allowed only two hits and Lee three. In the top of the seventh inning, Cody Ross and Juan Uribe singled back to back to put two runners on with no outs. The next Giant batter, Aubrey Huff, who had never laid down a bunt in his Major League career, successfully executed a sacrifice bunt, one where only a quick play by Lee prevented Huff from reaching base himself. Runners were now at second and third base for Pat Burrell. 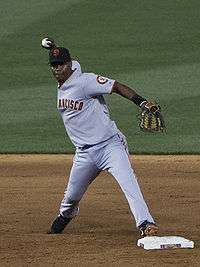 Lee struck out Burrell (10th time Burrell fanned in the Series), but then allowed a three-run homer on a 2–0 slider by Édgar Rentería to left center field, putting the Giants ahead 3–0. San Francisco outscored Texas 29 to 12, and shut out the Rangers twice. The Giants became the second team in the 2010 postseason to record two shutouts in a series since the Philadelphia Phillies shut out the Cincinnati Reds twice in the NLDS. The Rangers were the first team to be shut out twice in the World Series since the Baltimore Orioles recorded three shut outs against the 1966 Los Angeles Dodgers en route to a sweep in the World Series. Édgar Rentería's three-run homer was the second World Series championship-clinching hit of his career, the first coming with the Florida Marlins in 1997. Edgar was named the MVP of the series. Rentería hit .412 (7 for 17) with six RBIs in the Series. ↑ Walker, Ben (October 25, 2010). "AP source: World Series umpires include 1st timers". Yahoo! Sports. Associated Press. Retrieved October 25, 2010. ↑ "2010 World Series". Baseball-Reference. Retrieved January 6, 2014. 1 2 3 4 5 6 Scott, Laurence (November 1, 2010). "Giants Bring World Series Championship to West Coast". NBCBayArea.com. Retrieved November 2, 2010. ↑ Chass, Murray (June 13, 1997). "Baseball Crosses Great Divide: AL 3, NL 1". New York Times. p. B9. ↑ Verducci, Tom (September 29, 2010). "Game 3 Could Get Earliest World Series Start Time in 23 Years". Sports Illustrated. Retrieved October 27, 2010. ↑ Sarah B. (October 26, 2010). "VIP Giants bash at the Academy of Sciences tonight. Fireworks!". Richmond SF Blog. Retrieved October 27, 2010. ↑ "Newsom makes friendly wager on World Series". abclocal.go.com. October 26, 2010. Retrieved October 28, 2010. ↑ Araton, Harvey (October 14, 2010). "Out of a Failed Drug Test Came Team Unity". The New York Times. Retrieved November 3, 2010. ↑ Nightengale, Bob (October 27, 2010). "Giants bats erupt against Lee; win Game 1 vs. Rangers 11–7". USA Today. Retrieved October 28, 2010. ↑ "Recap: San Francisco vs. Texas". USA Today. October 28, 2010. Retrieved November 3, 2010. 1 2 "Recap: Texas vs. San Francisco". USA Today. October 31, 2010. Retrieved November 3, 2010. ↑ Haft, Chris (November 1, 2010). "Madison avenue! Giant road show makes it 3-1". mlb.com. Retrieved November 1, 2010. ↑ "Recap: Texas vs. San Francisco". USA Today. November 1, 2010. Retrieved November 3, 2010. ↑ "Rapid Reaction: Giants are champions". ESPN. November 1, 2010. Retrieved November 5, 2010. ↑ "Recap: Texas vs. San Francisco". USA Today. November 2, 2010. Retrieved November 3, 2010. ↑ "Boxscore:Texas vs. San Francisco – October 27, 2010". MLB.com. October 27, 2010. Retrieved October 27, 2010. ↑ "Boxscore:Texas vs. San Francisco – October 28, 2010". MLB.com. October 28, 2010. Retrieved October 28, 2010. ↑ "Boxscore:San Francisco vs. Texas – October 30, 2010". MLB.com. October 30, 2010. Retrieved October 30, 2010. ↑ "Boxscore:San Francisco vs. Texas – October 31, 2010". MLB.com. October 31, 2010. Retrieved October 31, 2010. ↑ "Boxscore:San Francisco vs. Texas – November 1, 2010". MLB.com. November 1, 2010. Retrieved November 1, 2010. ↑ Gonzalez, Alden (November 29, 2010). "Giants, Rangers collect their Series shares". Baseball Almanac. Retrieved November 29, 2010. ↑ "The World Series Is Truly Global With An International Audience". Fang's Bites. October 27, 2010. ↑ "ESPN America TV Schedule". ESPN America. October 27, 2010. Retrieved October 27, 2010. 1 2 McElroy, Tom (October 30, 2010). "Fox, Cablevision reach agreement to end blackout". Yahoo! Sports. Associated Press. Retrieved October 30, 2010. ↑ "2010 World Series Tied As Lowest Rated Ever". Sports Media Watch. November 2, 2010. ↑ "Steelers-Saints tops World Series in ratings". Pro Football Weekly. November 1, 2010. ↑ Schulman, Henry (November 9, 2010). "Jon Miller, Joe Morgan out after 21 years at ESPN". San Francisco Chronicle. ↑ Smith, Matt (October 27, 2010). "A guide to the 2010 World Series". BaseballGB. Retrieved October 18, 2011. ↑ Walker, Ben (November 2, 2010). "Giants win World Series behind Lincecum, Renteria". Yahoo! Sports. Associated Press. Archived from the original on June 29, 2011. Retrieved November 2, 2010. ↑ Shpigel, Ben (November 1, 2010). "Rookie's Gem Has Giants On Verge of Championship". New York Times. p. D1. The Giants...secure the Bay Area's first title since...the 49ers won the Super Bowl. ↑ "Giants receive trophy". MLB.com. November 2, 2010. Retrieved February 17, 2011. 1 2 Waldstein, David (November 4, 2010). "After 52 Years of Waiting, One Delirious Day". New York Times. Retrieved November 17, 2010.